There has been a lot of discussion at this week’s World Urban Forum about the use of data as a key tool in the development of inclusive, sustainable cities. Key to this discussion is how data can be used in the cities of Africa, Asia and Latin America, most of which still face major challenges around urban poverty and whose city development strategies, for the most part, continue to exclude the large majority of these cities’ populations – the urban poor. But yesterday at SDI’s networking event, a strategically different approach to data was presented and discussed. The Know Your City campaign – a global campaign for gathering citywide data on slums as the basis for inclusive partnerships between the urban poor and their local governments – was presented as a critical component of the push for urban data. When communities of the urban poor collect data about their own communities, in partnership with their local and national governments, they are armed with the necessary tools to become key players in the development of strategies of urban development that take into account the realities and needs of the city’s urban poor majority. In our networking event, delegates from SDI-affiliated urban poor federations and support NGOs, the SDI Secretariat, and key international networks and agencies discussed the importance of this campaign in greater detail. Jack Makau of the SDI Secretariat spoke on the history of SDI’s data collection strategies. SDI-affiliated federations of the urban poor have been collecting information about themselves for decades. This data has led to upgrading projects in affiliates across Africa, Asia and Latin America, and has formed the basis of large-scale slum upgrading interventions in India, South Africa, Zimbabwe, Kenya and more recently, Uganda. In the last year, however, the SDI network has begun to standardize and aggregate this data in a way that we have not been able to before. This means that urban poor communities have expanded their scope – from collecting data only about the settlements where they live, to collecting data on all the slum settlements in their cities. This includes demographic, spatial and economic information that allows for a picture of the whole city – data that can be used to drive communities’ negotiations with local government for slum upgrading and development at the citywide scale. The accuracy and ownership of the data is enhanced because it is collected and used by communities in discussions with city governments on upgrading plans and programs, meaning that the communities themselves have a greater stake in the need for accurate, up-to-date information. These claims were supported by the experiences of SDI affiliates from Kenya and Zimbabwe. Catherine Sekai, national leader of the Zimbabwe Homeless People’s Federation, related that the Federation, alongside their local authority, “profiled the entire city of Harare, settlement by settlement” to identify peoples’ needs on the ground. This led to the transfer of land by the city to the communities for the construction of upgraded houses in Dzivaresekwa Extension, one of Harare’s largest slums. 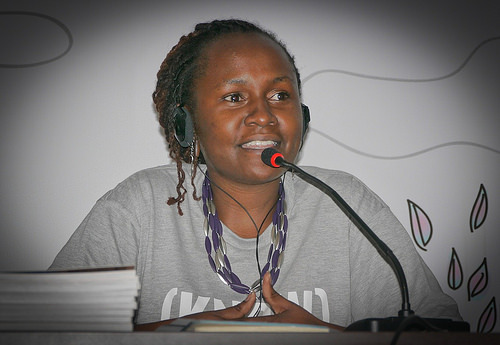 Another example of the power of community-collected data came from Irene Karanja, executive director of Muungano Support Trust, support NGO to the Kenyan urban poor federation Muungano wa Wanavijiji. Karanja shared some key findings from 300 community-driven profiles from slums in 20 cities and towns across Kenya. Two central issues emerged from these profiles: land and sanitation. Most of the land occupied by slums in Kenya is privatized, and currently under high threat of eviction from developers looking to take back the land as land values in Kenya’s cities continue to rise. Because of the status of land ownership, interventions around sanitation have been nearly impossible and continue to threaten health and security of slum residents, particularly women. Lastly, Anaclaudia Rossbach of Cities Alliance, coming from her experience in municipal government and her background as an economist, went on to endorse the need for community-collected slum data as critical to the successful implementation of slum upgrading projects. Indeed, with SDI sitting as a member of the Cities Alliance Executive Committee, the Know Your City campaign is part of the Cities Alliance medium term agenda. Rossbach emphasized the key point that it is only feasible to collect accurate data if the local people take ownership of the process – a critical component of SDI’s data-collection strategies.